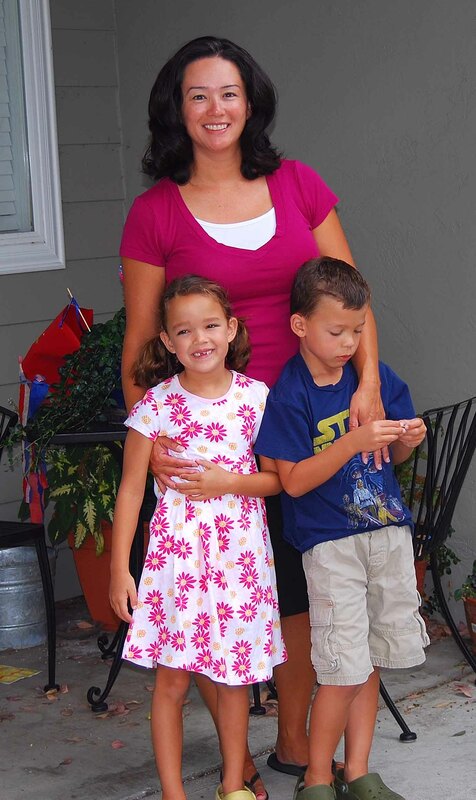 My kids turned 6 years old today. 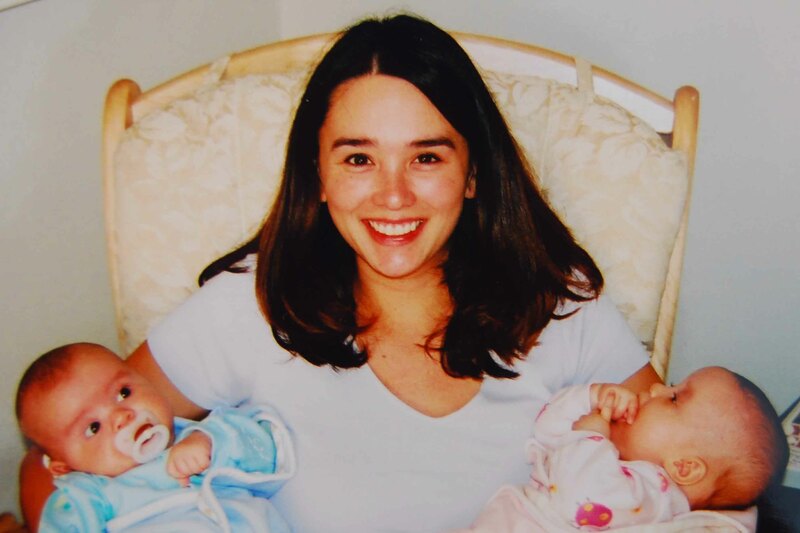 It feels like a lifetime ago when they came into the world. So much has changed since then. 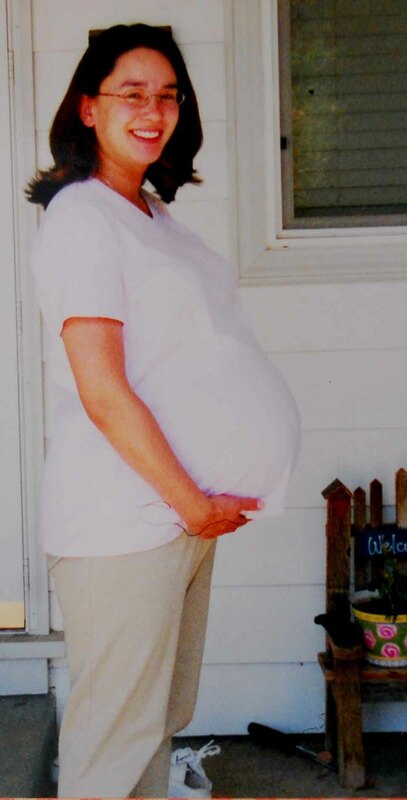 Here’s a photo of me on July 12, 2002 (my twins original due date), as we were leaving for the hospital. 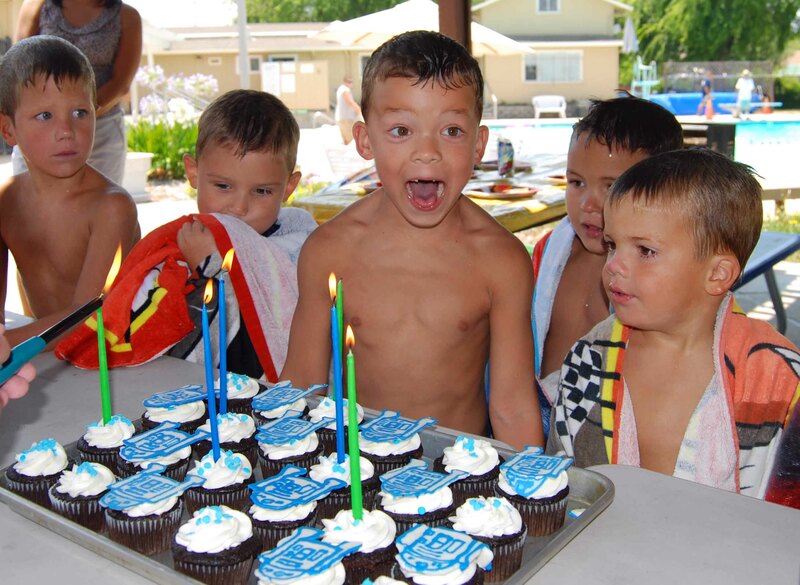 Think he liked the cupcakes? 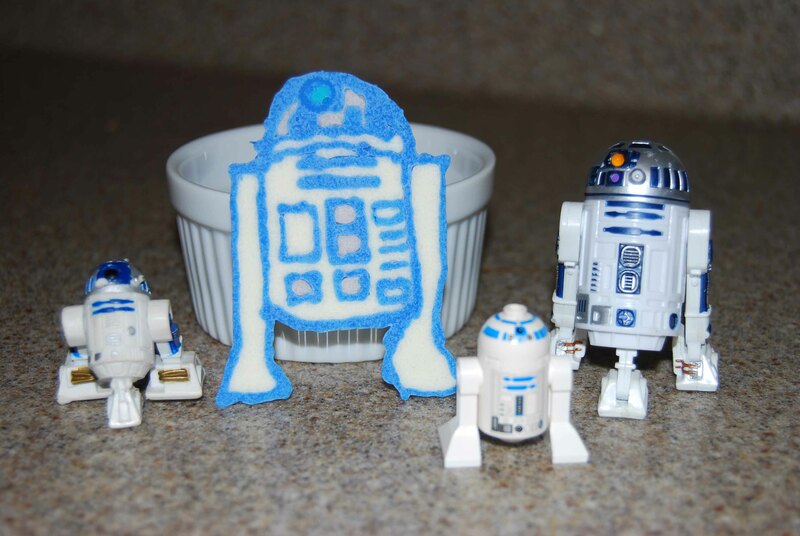 Here’s how I made these R2-D2 Cupcake Toppers. I made dog candies for my daughter’s cupcakes. She loves dogs. One mom asked where I ordered the dog candies from! That was a nice compliment (I think). 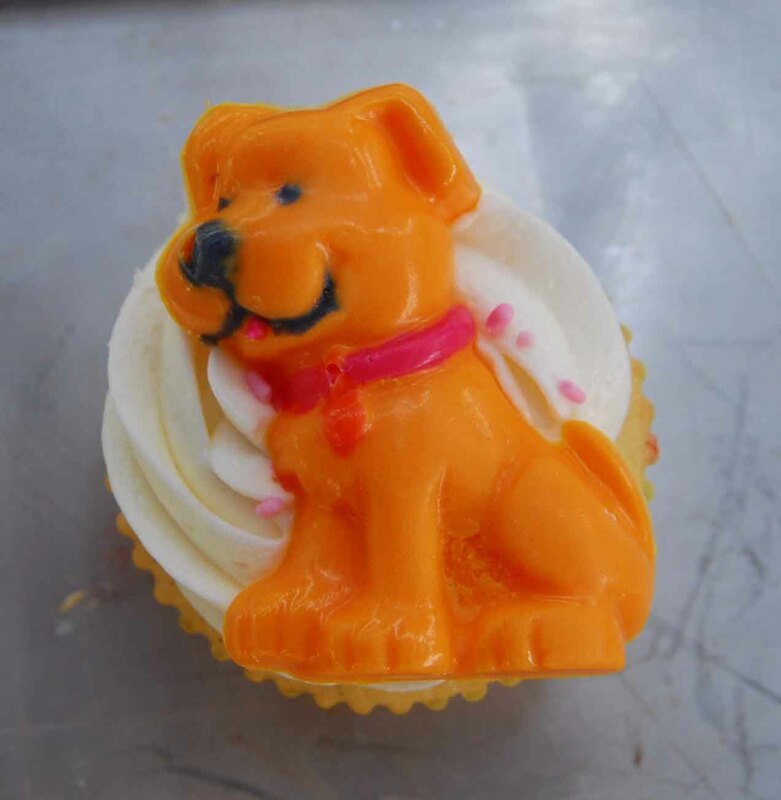 To make these I picked up a dog candy mold from Michaels. The hard part was doing the dogs one at a time. First the nose, mouth and eyes. Then the dog collar and tongue. Then the dog tag. And finally the whole dog. After each part I had to put my candy into the refrigerator so it could quickly set up. It was a super fun day, but now I’m beat…back to the gym tomorrow! 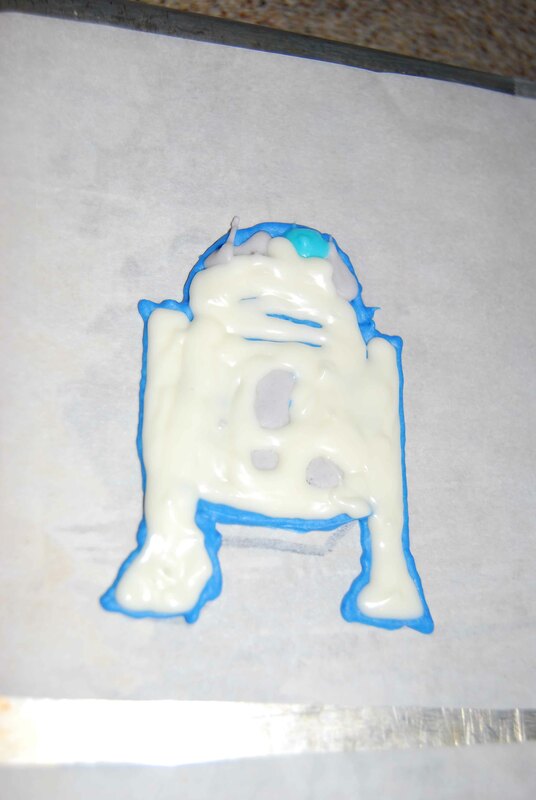 Then I remembered Bakerella’s Mother’s Day Post and wondered if I could use the same technique to create R2-D2’s…it worked!!!! 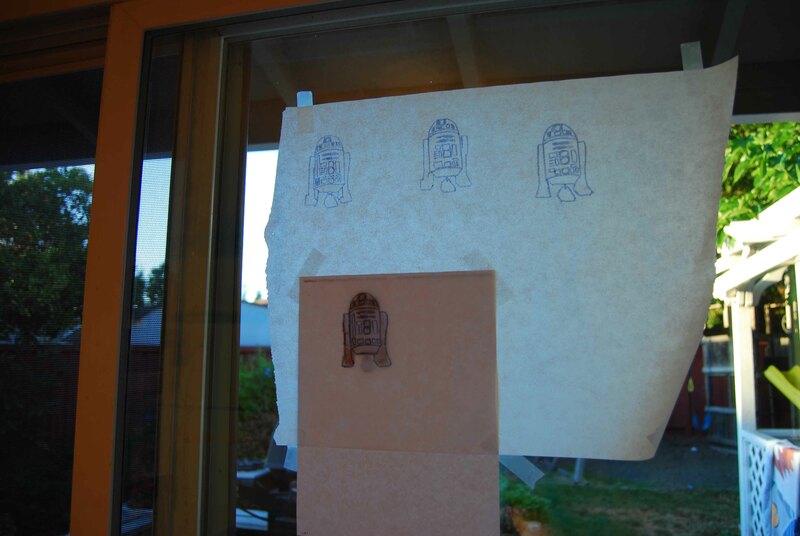 Here’s what I did…First I searched the computer for an R2-D2 that I could (or hoped I could) draw. Once I found it I traced it onto a sheet of parchment paper using a permanent marker. Next, I cut and taped my flipped parchment paper onto an upside down sheet pan. (I worried the edges would impede my piping skills and I didn’t want the marker to run into the candy). Then, I melted some Winton candy melts, stirred in some blue coloring and started with the outline and blue squares and shapes. 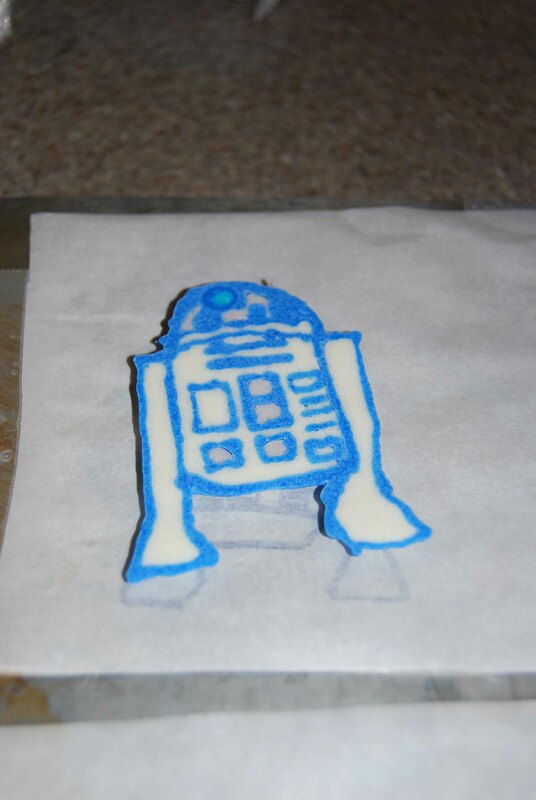 Whoops, while piping the candy I realized that R2-D2 does not look right flipped so I improvised with my squares and circles. Again, I melted more candy melts to fill in the gray areas. Then, more melted candy for the bright blue circle. Again, melt more candy melts to fill in the white areas. Make sure you bang the pan against the table or counter to release any air bubbles and force the candy into the nooks and crannys. Finally, patience patience patience as these set up in the refrigerator. 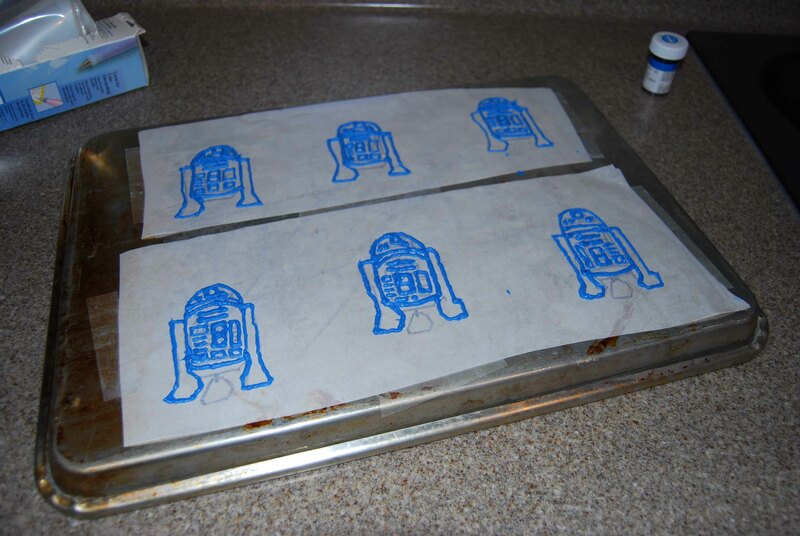 These easily moved once they set up on the parchment paper. I had no trouble flipping them over with my fingers. So, I am quite happy with how these turned out. Now, I know that they are not wonderful, but they will make for a very happy 6 year old boy! 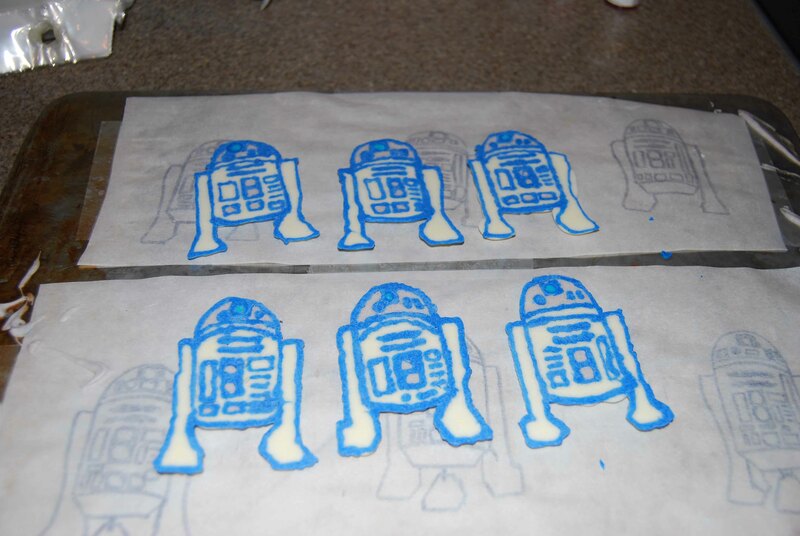 Plus, I have 6 little R2-D2’s that will look great on my son’s cupcakes. Thank goodness we didn’t invite too many kids. Although this didn’t take too long. I have these sitting in an airtight container in the freezer, but I am slightly worried about breakage. So, I will probably make more again this week, just to be on the safe side. I know, with me it’s either jello jello jello or cupcakes cupcakes cupcakes. Not a lot of variety. But I’m a traditionalist, and when I know something works I stick to it. 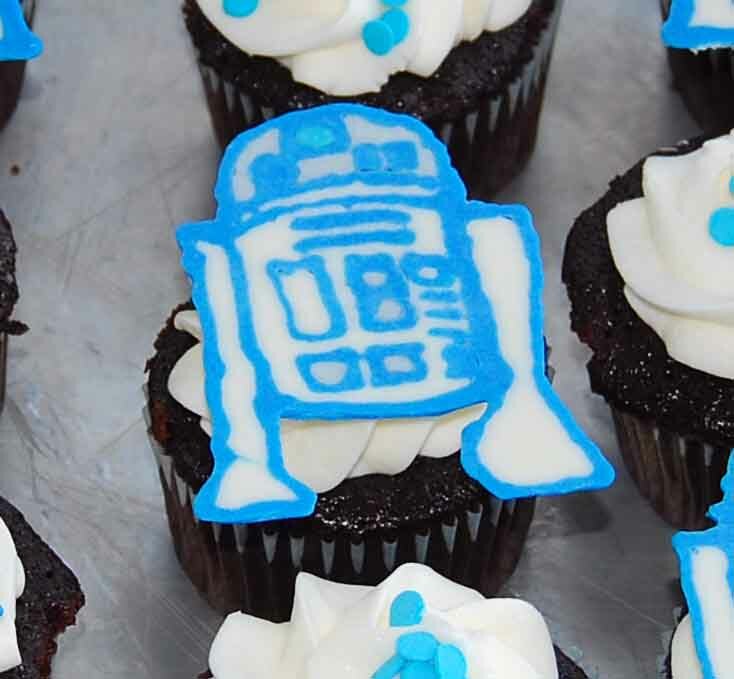 Like these cupcakes for example. Preheat the oven to 350 degrees. 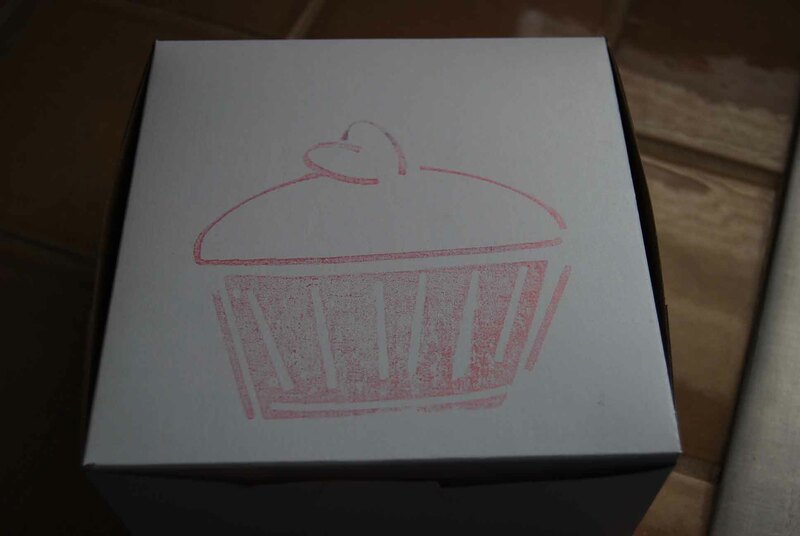 Line cupcake pan with paper liners. I get 36 cupcakes from this recipe. Sift the flour, sugar, cocoa, baking soda, baking powder, and salt into standing mixer’s bowl. In another bowl, combine the milk, vinegar, oil, eggs and vanilla. Turn mixer on low and slowly add the wet ingredients to the dry. Keep the mixer on low and slowly pour in the hot coffee. Be sure to scrape down the sides and mix again. Because this is a wet batter, I pour it into a 4-cup measuring bowl and then pour it into my cupcake liners. Fill 1/2 way to 2/3 full. Bake at 350 degrees for 15 minutes. Allow to cool completely on wire racks before frosting. Cream the butter and cream cheese. With the mixer on low, add the sugar slowly. Then the vanilla. The frosting made enough for 24 cupcakes. I would make 50% more to frost all 36. 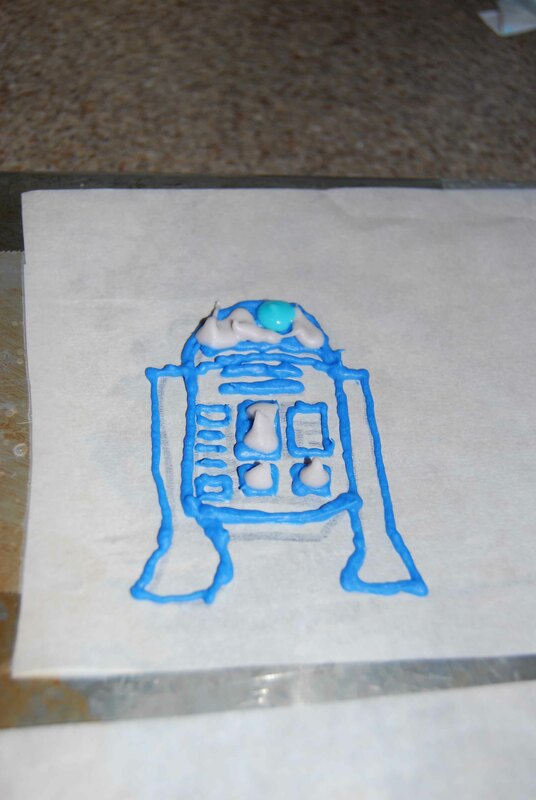 I put the frosting in a piping bag with a big star tip. 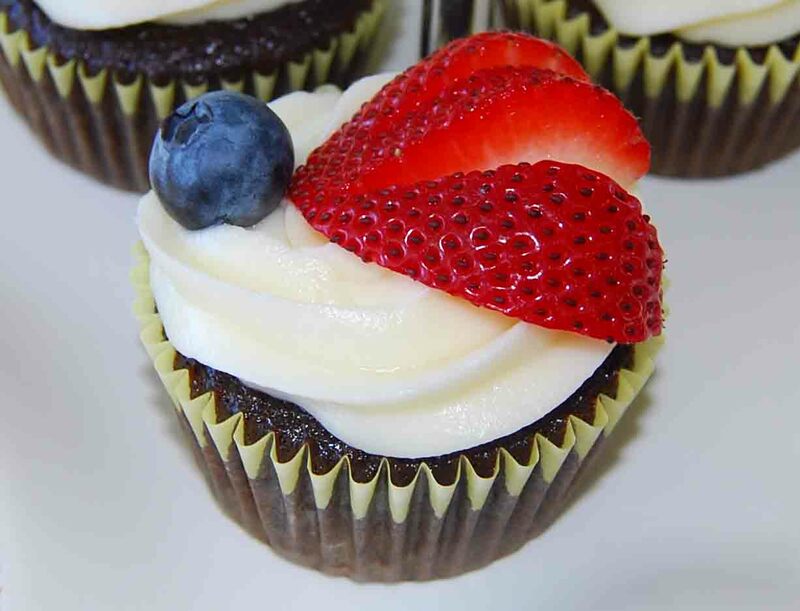 Start by going around the outside of the cupcake and then work your way up to the center. Store covered in the refrigerator. 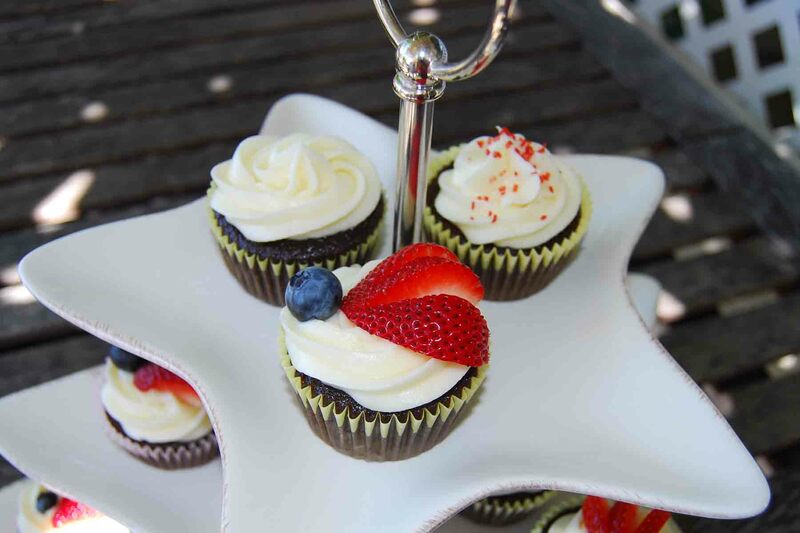 When you are ready, bring the cupcakes to room temperature and decorate with sprinkles and fruit. When my sister gave me The Great Cupcake Pan for my birthday last week, I didn’t need to wait long for a reason to try it out…my daughter lost her 5th tooth today! I used the recipe from the package and LOVED it! (Surprising for Williams Sonoma) This will be my go-to recipe when a fantastic tasting vanilla cake is needed. 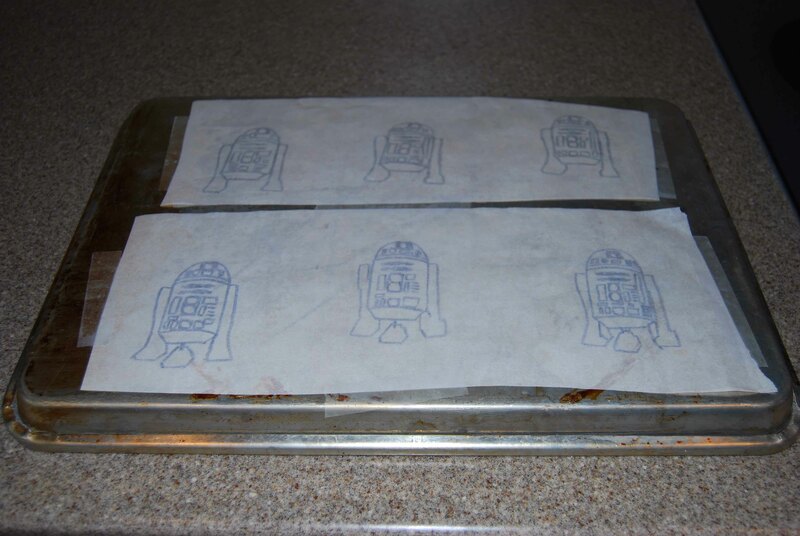 Over a sheet of waxed paper, sift together the flour, baking powder and salt; set aside. In the bowl of an electric mixer fitted with the paddle attachment, beat the butter on medium speed until smooth and creamy, about 30 seconds. Add the granulated sugar and continue beating until light and fluffy, about 5 minutes, stopping the mixer occasionally to scrape down the sides of the bowl. Add the eggs a little at a time, beating well after each addition. Beat in the vanilla just until incorporated, about 1 minute. Reduce the speed to low and add the flour mixture in three additions, alternating with the milk and beginning and ending with the flour. Beat each addition just until incorporated, stopping the mixer occasionally to scrape down the sides of the bowl. Bake until a toothpick inserted into the center comes out clean. 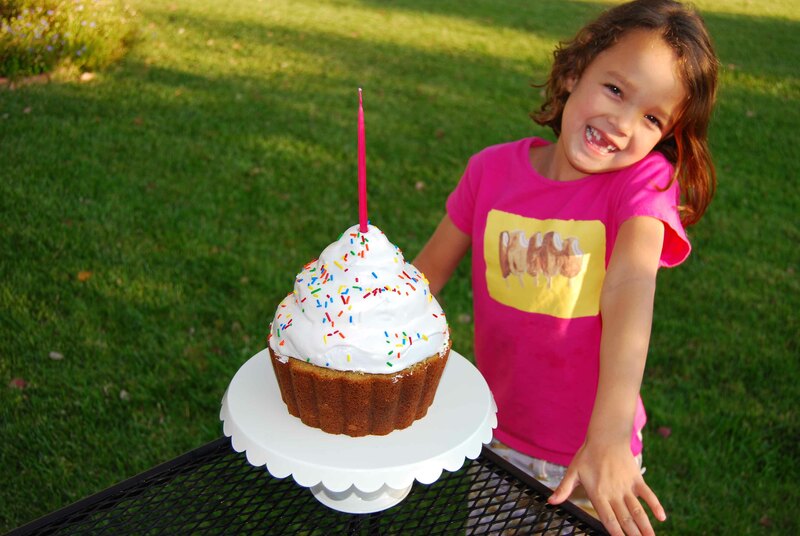 This photo shows just how big this cupcake is. My daughter was thrilled! To find the Great Cupcake Pan, go to Williams Sonoma and get The Giant Cupcake Pan. The top and bottom are made of cake. And the top half is covered in marshmallow fondant (yep, I still need to work on it). …the possibilities are endless with this one! Oh, and Pam for Baking is all I needed to get this cake to slide right. I’m away on vacation this week. 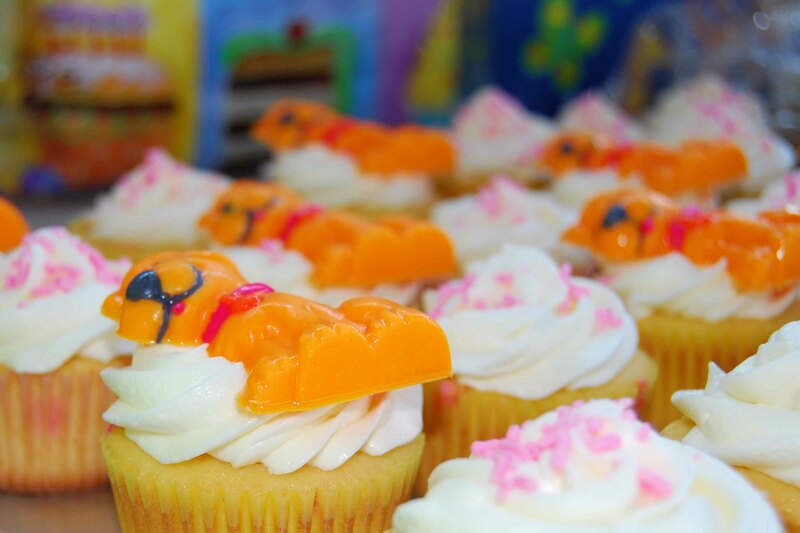 While I’m away, feast your eyes on the Crushcakes Cupcakery’s Cupcakes! 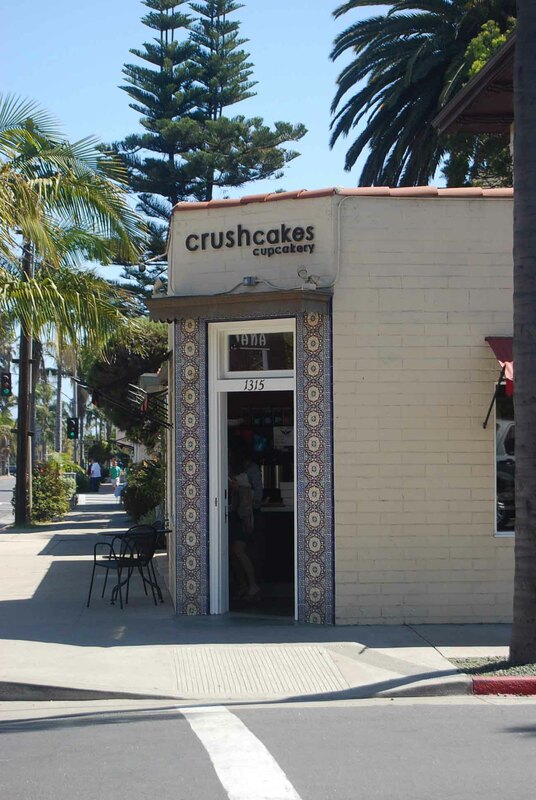 We stopped by Santa Barbara’s premier cupcakery on a recent visit to the central coast. 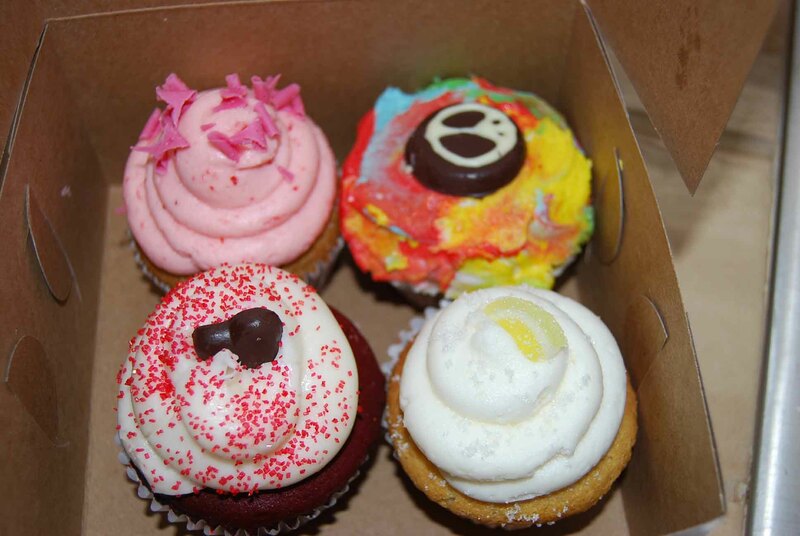 Of course I wanted to sample each flavor, but decided 4 would be a respectable number of cupcakes to try. 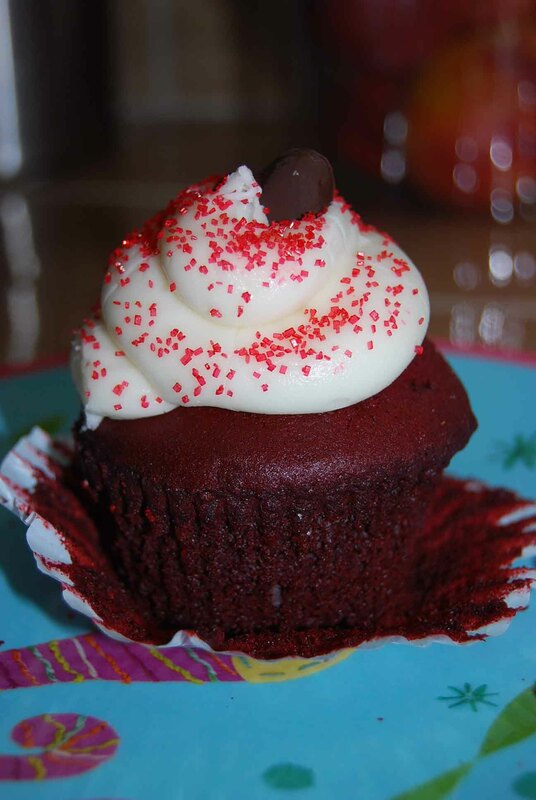 My first choice was their signature cupcake, the “crushcake” with red velvet cake and a chocolate heart dipped in sour cream frosting. This was the one I tried first, but was so disappointed. It was over baked and dry. 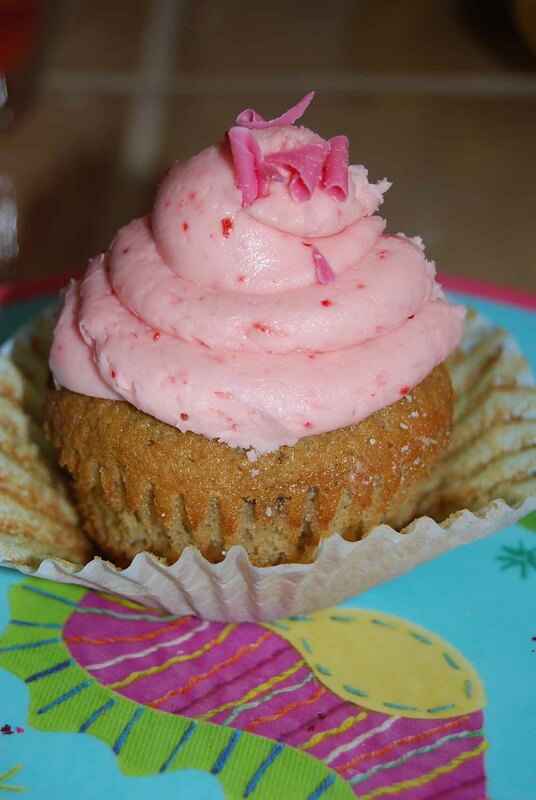 Next I tried the “strawberry blush” cupcake. AMAZING!!!! I would love to get my hands on that strawberry pink frosting recipe. For now I’ll just have to plan another visit. 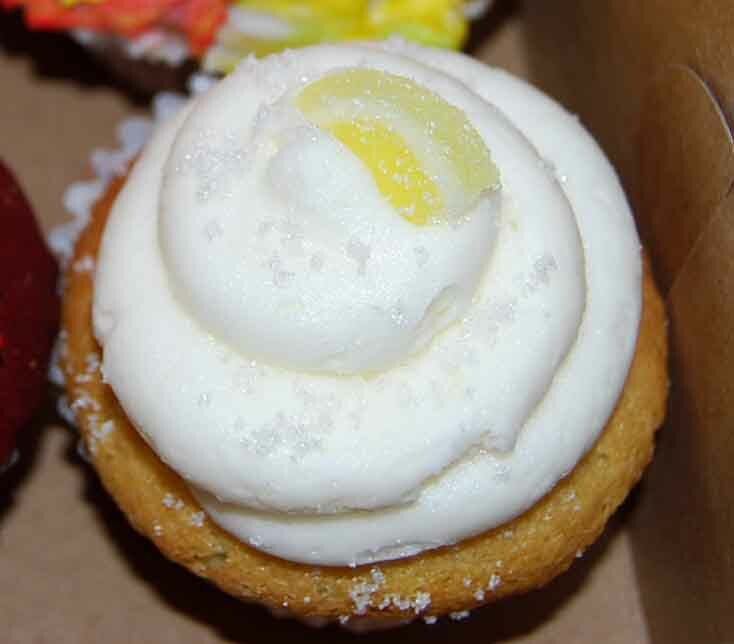 I followed that with the “lemon drop” cupcake…even better than the strawberry! The frosting was to-die-for! Seriously people. 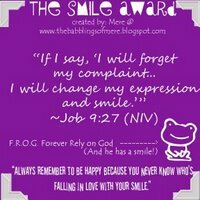 In the words of my dear friend Mary, “I thought the heavens were going to open up and angels descend upon us”! Lemon cake with sweet lemon frosting and crushed lemon drop candies. I will get one of these every time I go. 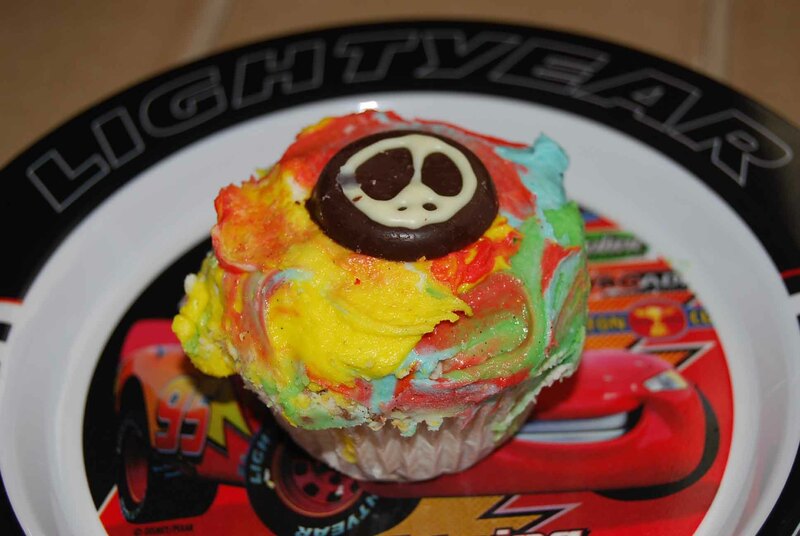 Finally, my kids picked the “peace cake” cupcake. Okay, I wouldn’t have gotten this one for myself, but I am so glad they picked it. Wonderful! Vanilla bean cake and tie-dyed vanilla bean frosting. I loved the flavors of this one. The cake was wonderful. 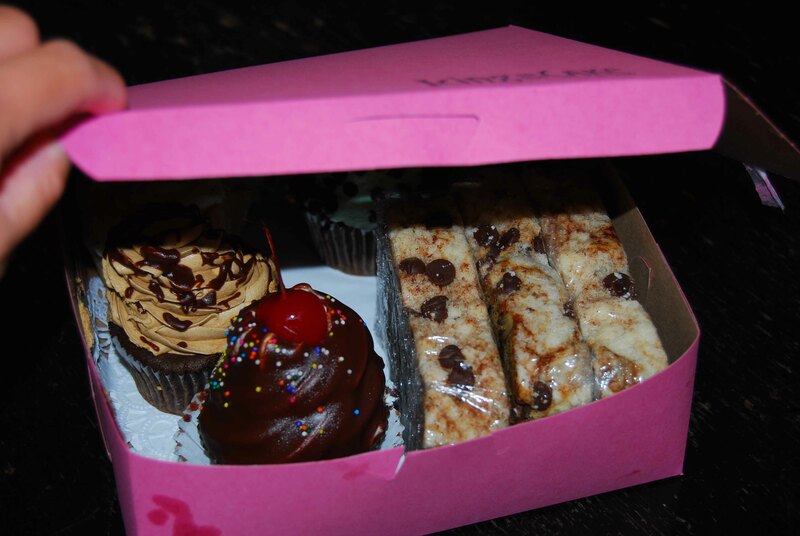 Hopefully I will be back to Crushcakes for another box full of cupcakes soon. My husband came home carrying a pink box. Some girls swoon over flowers. For others, it’s that famous blue box. But for me, it’s The Pink Box. And now I’m home alone with The Pink Box. My hubby and dear daughter ran to Frys and my son is playing at the neighbor’s house. And I can’t think about anything but The Pink Box. So I pick it up. Then close it up and put it away because I have little self control right now. Yep, The Pink Box renders me completely incapacitated. And since I can’t think of anything but The Pink Box, I might as well write about it. And I’m hoping that as soon as this post is up, everyone will be home and we’ll be able to dive into The Pink Box. 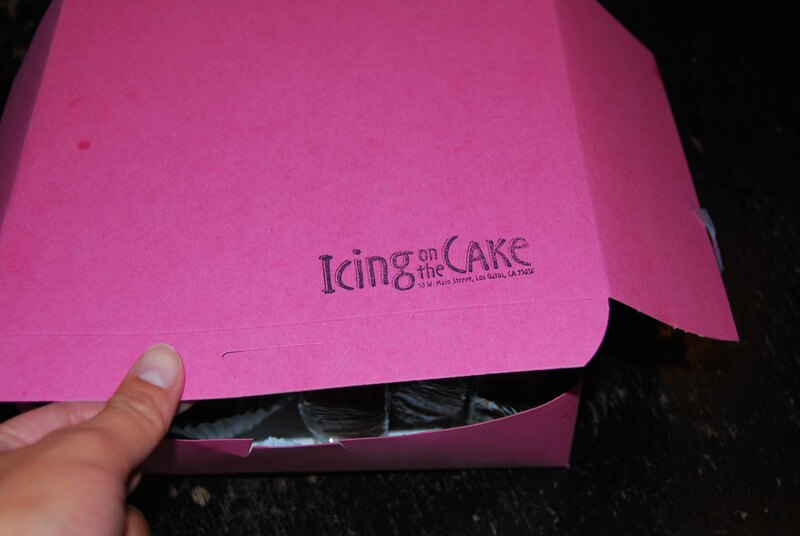 The Pink Box comes from one of our favorite bakeries, Icing on the Cake. 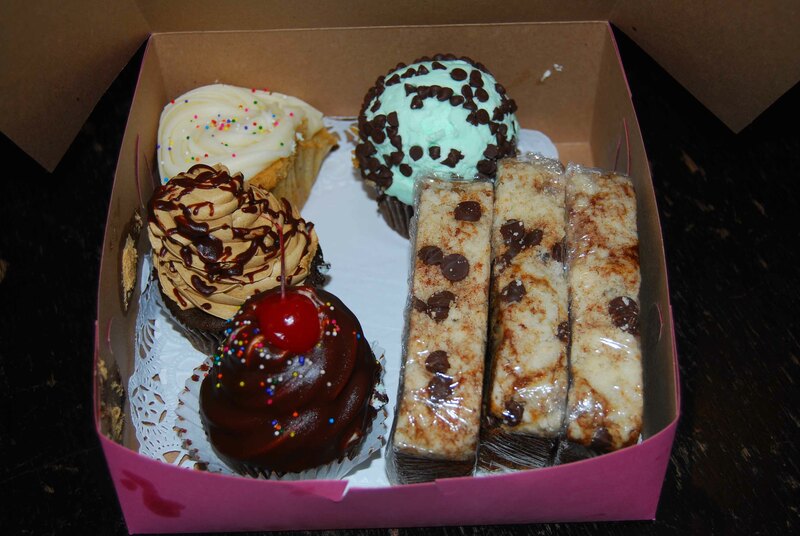 Inside the pink box there is a black and tan cupcake, banana cupcake, chocolate sundae cupcake, mint chip cupcake and banana bread. They have the best banana bread! Okay, I hear the car doors!!!!! 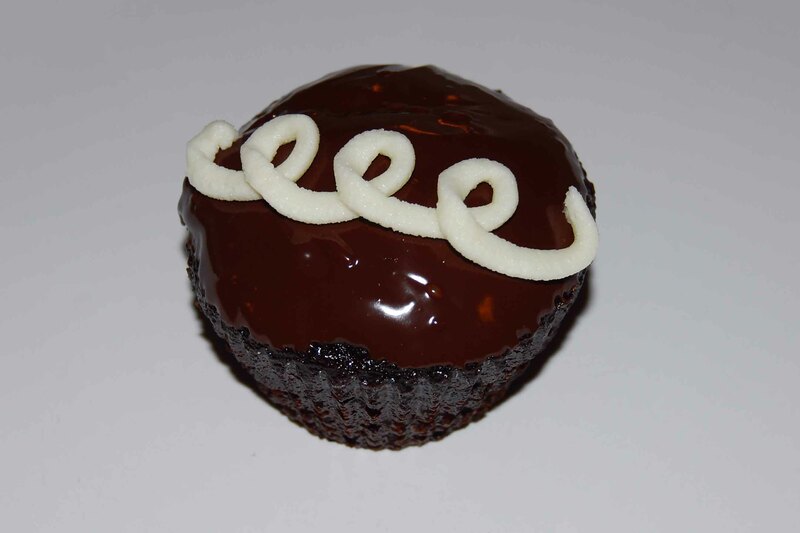 The Hostess Cupcake goes organic in celebration of Earth Day! I used Beatty’s Chocolate Cake recipe for the cupcakes. Organic (mostly) everything. The difference was I had trouble finding organic vegetable oil so I substituted for organic olive oil. These turned out much lighter than the non-organic version and they rose high. For the filling and glaze I referred to Megans Cookin and her Mock Hostess Cupcakes. Megan, your piping and decorating skills leave me to shame! I made regular size cupcakes and baked them for about 20 minutes. Once they had cooled completely, I used a large pastry tip to poke holes in the tops of the cupcakes. After that I used the same size tip on a pastry bag, and piped the filling into the holes. The white swirl on top is just melted white chocolate. 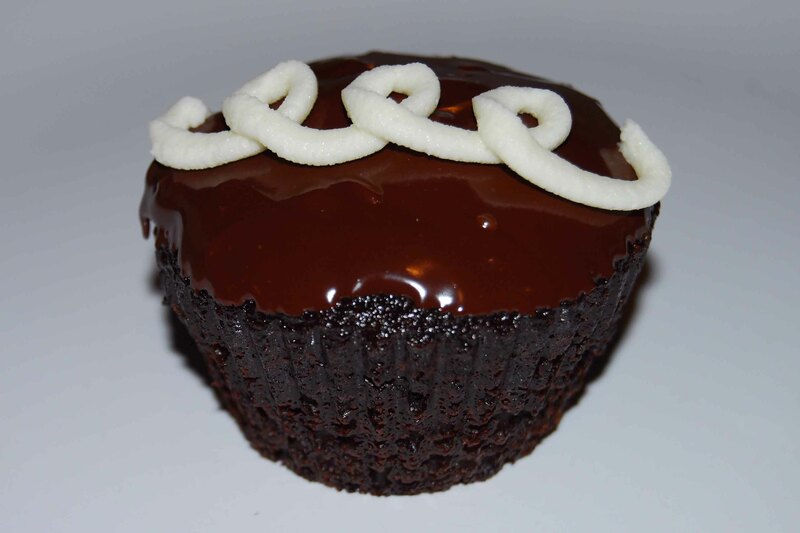 Dishing out these Organic Hostess Cupcakes to Cupcake Hero’s April Event: Earth Day! I stored these under a cake dome on the counter…great the next day! Maybe even better than the first. I just love a dessert that can be made the day ahead! I was thinking of that bag of left over Easter Candy sitting in my freezer. Specifically, it was a bag of Reese’s Milk Chocolate Peanut Butter Eggs. And coincidentally, my generous and trusting sister just lent me her copy of The Secrets of Baking by Sherry Yard. There are so many recipes I want to try. Not surprisingly, I turned to her Chocolate Buttermilk Cupcakes first. But I needed a frosting…so in came those peanut butter eggs…and the Reese’s Peanut Butter Frosting was born! Preheat the oven to 350 degrees. 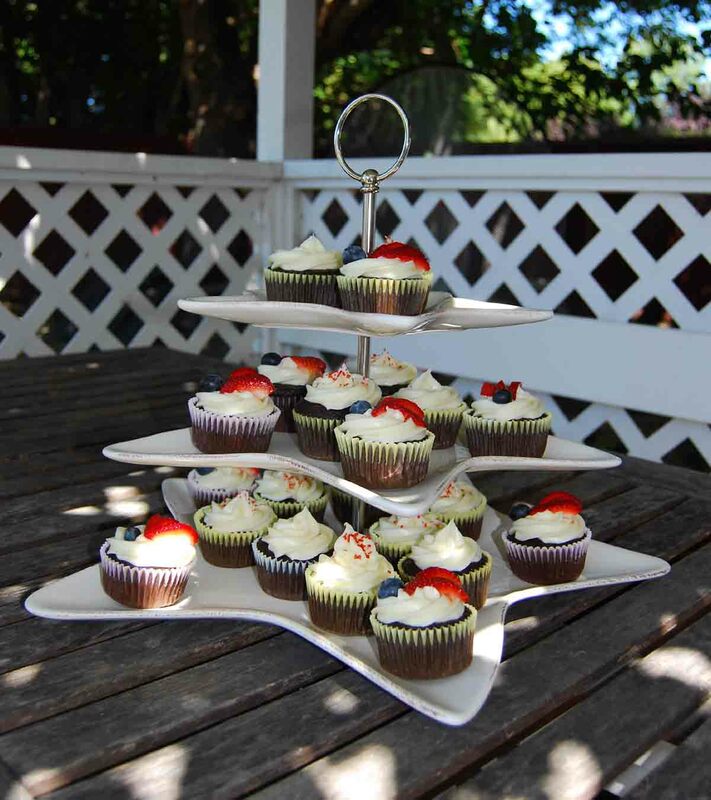 Line a sheet pan with mini-cupcake paper cups. Sift the flour, cocoa powder, baking powder, and salt into a bowl and set aside. 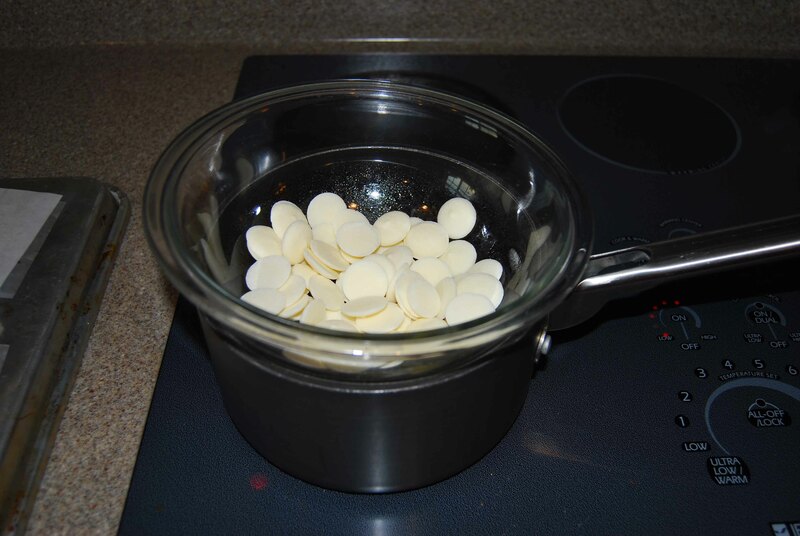 Combine the sugar and eggs in a bowl and set over a saucepan simmering with water, creating a double boiler. Whisk until the temperature reaches 110 degrees, about 3-4 minutes. (I just dipped in my finger and stopped when it felt hot to the touch). Remove from the heat and transfer the bowl to a standing mixer fitted with a whisk attachment. Whip on high speed for 5 minutes, or until the eggs are three times their original size and thick and place yellow in color. Turn down the mixer to medium and stream in the warm melted butter. Mix until incorporated. Fold in one third of the dry ingredients using a balloon whisk. Then add one third of the buttermilk. Continue adding alternately in thirds until all ingredients are mixed. Add the vanilla. Scoop the batter into mini-cupcake cups with a cookie scoop. Bake for 15 minutes. Allow to cool completely before frosting. Unwrap the Reese’s Peanut Butter Eggs. Put in in glass bowl an microwave for 30 seconds. Stir and then microwave for 10 seconds. Continue to microwave and stir until the peanut butter eggs are completely melted. Mix in the cream cheese then the powdered sugar. When the frosting has cooled, put in plastic bag, snip off the end, and frost the cupcakes. Best enjoyed the day they are made. Or wrap tightly and store in the refrigerator. Bring up to room temperature before serving. I made these coconut cupcakes for Easter, but this time, I made them mini. This is my new favorite way to make cupcakes. Everyone raved about them. The small size made them so approachable. Plus, the baking was a breeze! 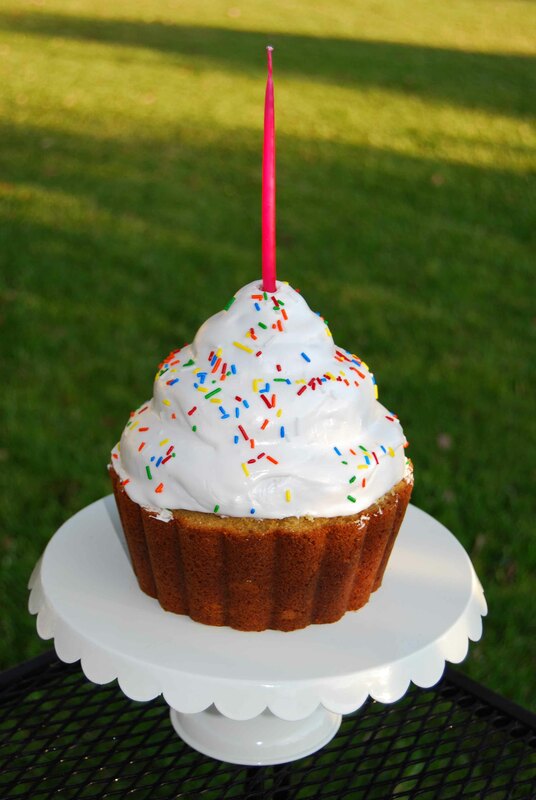 Here’s what you need: Wilton Nut and Party Cups. Each package comes with 36 mini cups. No mini-cupcake pan needed or wanted. Just put these cups on a baking tray/cookie sheet, fill with batter, and put them in the oven. Perfect! I am convinced (for the time) that this is the only way to do cupcakes! 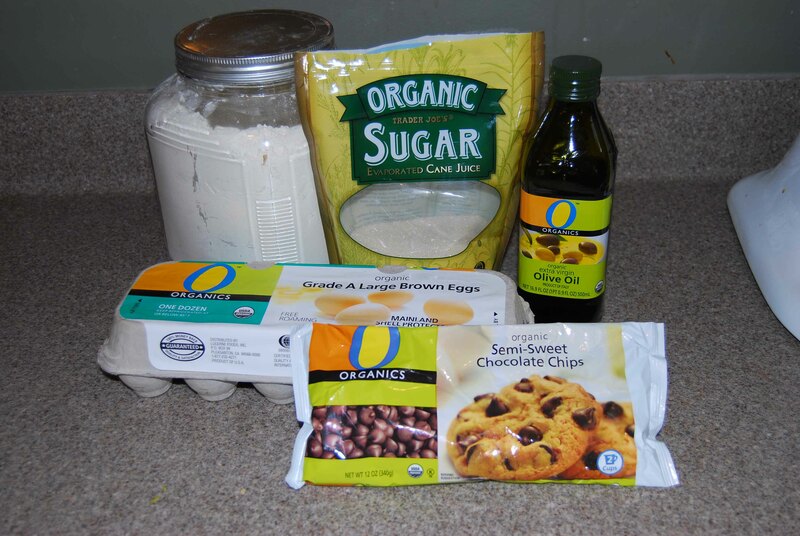 In a large bowl mix the oil and sugar. Add the eggs one at a time. Mix in the vanilla and almond extract. Turn the mixer on low and add the flour, one cup at a time. Then add the baking powder, baking soda and salt. Mix on medium until well combined. Turn the mixer back to low and pour in milk. Then mix in coconut. 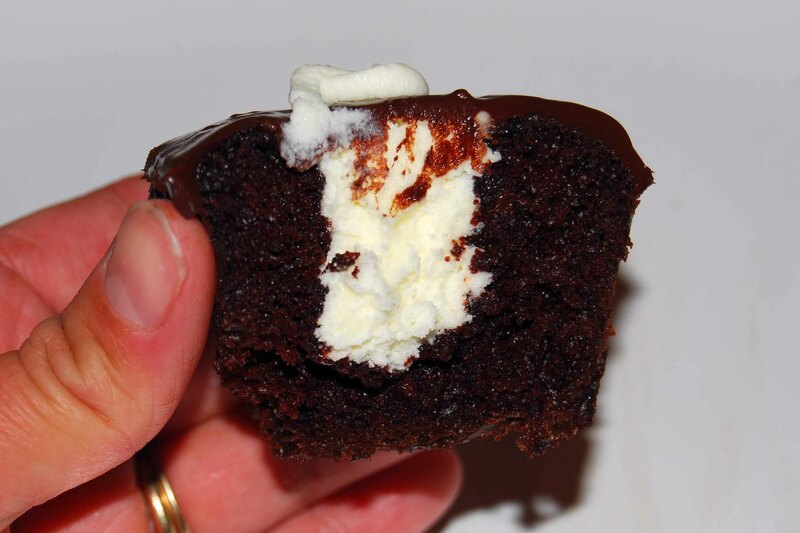 Using a cupcake scoop, fill a prepared cupcake pan. This makes 30 cupcakes. Bake at 350 degrees for 22 minutes. Allow to cool in the pan for 5 minutes then cool completely on a cooling rack. Cream together the cream cheese and butter, add the vanilla and almond extracts, then sift in sugar. Fill a pastry bag with frosting. Cut a 1 inch hole. Generously pipe the frosting. Sprinkle on sweetened shredded coconut and then pat gently. These can be made the day ahead. Store in the refrigerator in an airtight container. frost the cupcakes before serving. Allow the cupcakes to come up to room temperature. For my dear friend Crystal, Happy Birthday!